Tip 1: Allow the first coat to dry for at least five minutes before applying the second. If the first coat's not completely dry, the second one makes the whole thing mushy and you'll have to wait three times as long for the polish to harden. Tip 2: Use a quick-dry spray. I love NAIL EXPERTS Liquid Freeze Quick Dry Spray from Avon. It reduces drying time by nearly half and, unlike many others, is in a pump bottle instead of an aerosol can, so it's not harmful to the ozone layer. 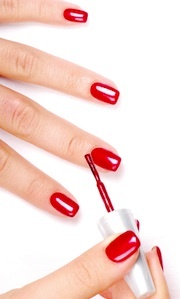 Tip 3: Empty out an old bottle of clear polish, wash the brush and fill the bottle with olive oil. Apply the oil (using the brush) to freshly painted nails and it will help expedite the drying process -- and impart a nice (albeit temporary) sheen. Tip 4: Dip your hands into a bowl of ice water. The cold helps solidify the polish. I also learned a cool trick for being able to tell whether or not your nails are really and truly dry; when you suspect that they are, gently touch two nails together -- you're good to go when they pull apart without a tacky, sticky feel. Now that you have these tips, it's time to pick your polish -- Click here. Avon will help.